In late April and early May of this year, Memphis briefly joined the fraternity of cities affected by natural disasters attributed to "global weirding." Thanks to snowmelt from the north and heavy rains, the Mississippi River stopped just short of beating its record flood level set in 1927. The musical "Show Boat" also opened that year, bringing the metaphor of an uncaring flow into a new context through the song "Ol' Man River." By the time the musical and movie came out, the steamboat era had drawn to a close. Without the need to worry about a dam, pumping station or flood impeding a river journey, massive hydrological engineering projects have now become the norm on the Mississippi. The U.S. Army Corps of Engineers, in treating the ebb and flow of water as a circle to be squared, has wrought a river that seems to exist only in designated municipal contexts. There is not one Mississippi River; there are as many rivers as the number of towns that line its banks. It is no longer a natural force that knits the North with the South, but convenient background noise. This story is echoed in waterways the world over: They either become zones for sluicing precious water, territory dividers or backdrops to tout in advertisements for new downtown co-ops. Steamboats once acted as a connecting thread, drawing disparate port cities into a larger, shared narrative. Now the Mighty Mississippi of song and folklore is mostly traversed by anonymous, grain-hauling barges or the odd recreational kayaker. As far as natural disasters go, the Memphis version of the Great Flood of 2011 was fairly benign. Homes were abandoned in the hundreds, not thousands, and over-flowing sewage was more of a hazard than the flow of the river itself. The slow rise of the waters was also timed perfectly for Memphis's annual Beale Street Music Fest, which typically signals the beginning of summer and good times to come. With the passing of time, the swelling Memphis river bank became a locus of both silent curiosity and gaggles of festivity. People on a lunch break, tourists strolling downtown and visitors from nearby states came to gawk at the river and upload pictures on their cellphones. Natural disasters are our new World's Fairs — we all witness a moment stemming from globally connected phenomena. I made this short video, in the atmosphere of bated breath and surreal festivity, in an attempt to examine how the seemingly disparate political grids of local decision-making are actually connected and felt on a national level. The two main, anonymous narrators view the river from their own vantage points and try to come to terms with what it means when an ignored element becomes "out of control." James Corner once wrote that the idea of a landscape is a combination of both "recollection" and "invention." Rivers inhabit both of these worlds, not only because human societies have come to rely on forceful hydrological manipulations to control a river's flow, but also because rivers are abrupt reminders of an edge, a mercurial change from solid land to swirling molecules. When the flood waters began to creep up, the denizens of Memphis were confronted with an edge that not only had moved, but was blurred. Land is plotted as annexed dots on a map, and our collective understanding of a crisis is blocked out and truncated. We can never be totally saved by the scale measurements of the engineer's ruler. According to Charles Waldheim, "the idea of landscape has shifted from the scenic and pictorial imagery to a highly managed surface best viewed, arranged, and coordinated from above." But, in the end, it is those on the ground that interpret the flood's flow. Prudence Katze was born in Memphis, Tennessee. She has been enjoying New York City's version of cicadas for the past seven years. 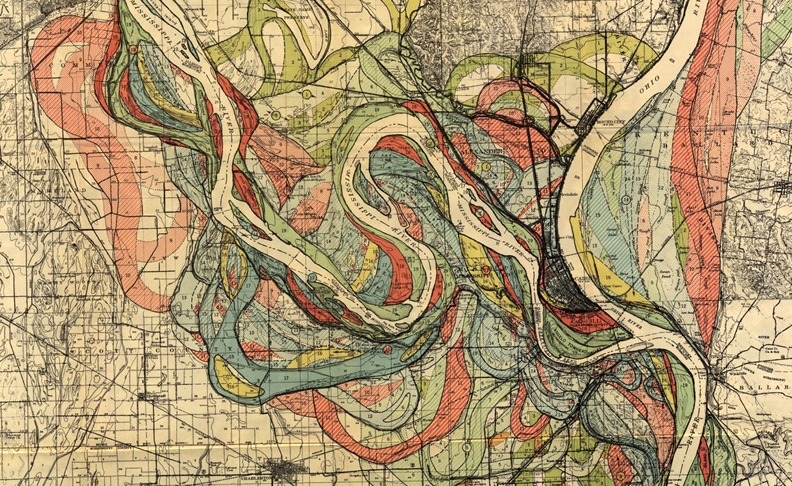 Credits: Image of the confluence of the Mississippi & Ohio Rivers from a detail of a Harold N. Fisk/US Army Corps of Engineers 1944 report on the "Geological Investigation of the Alluvial Valley of the Lower Mississippi River." Great post and video! I like the way you describe the river from different perspectives, combining history, theory, and experience in the present. I enjoyed reading this in light of the collection of posts on waterways at mammoth, f.a.d., and faslanyc. i loved these observations in text and video, quite well done.